The 2014 NMRA Jim Swarr award winner and third place finisher in Coyote Modified, “Dyno Joe” Cram, has teamed up with Holbrook Racing Engines (734-762-4315) for the 2015 racing season. The Coyote 5.0L engine was dropped off at the Michigan-based engine shop shortly after the New Year’s holiday and will be prepared for supercharged excitement come March 5-8, 2015 at Bradenton Motorsports Park for the NMRA Spring Break Shootout. 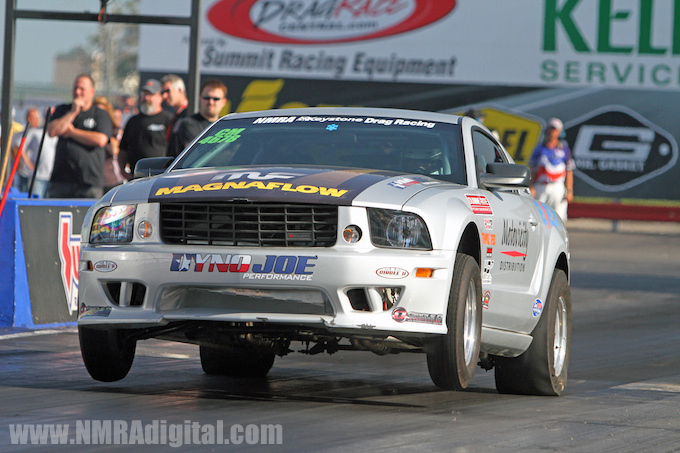 Dyno Joe blasted into the 8.40s last year with his ProCharger-pumped 5.0L but expects up the ante despite the rule changes for the upcoming season. In just the category’s sophomore season, the battle lines have been drawn with performances from last season thatNostradamus couldn’t have projected. There might have been weight piled on the category across the board in the Coyote Modified ranks, but the engine rules remain largely the same and are far more open than the Stock and Super Stock ranks that Holbrook has terrorized with the Cobra Jet crowd and various projects with Watson Racing. “I was shocked to find out how reasonably cost Holbrook was compared to other engine shops I was talking with for my new motor,” explained Dyno Joe. He continued, “you would think when you hear names like Kaase and Holbrook in the same sentence he would be unapproachable but that wasn’t the case, he is just a good ole’ boy!” Dyno Joe also explained they plan on doing some testing before the season on the engine dyno with different blowers before putting it back in the car in time for the Spring Break Shootout. The Texan, who is never shy with words, said that Holbrook was just as excited as he was to get involved with this project as Holbrook looks at the NMRA market as being a great fit for Holbrook Racing Engines. “He (ed note, Joe) dropped the engine off last week and I think there are some things we can do to make him really competitive,” said Chris Holbrook. For those who are unaware, Holbrook is currently the pilot of the baddest Cobra Jet in NHRA Stock Eliminator history with an 8.50 at 160 mph performance and he is also a former IHRA Pro Stock champion. His engine shop specializes in a wide-variety of combinations from big-inch naturally aspirated engines to the Coyote 5.0L that has wrecked so many indexes in NHRA competition. One of the catalysts for the Coyote Modified class is to thrust the engine platform into the highly-competitive NMRA heads-up ranks and give companies a place to develop better products, which eventually find their way to the street market. Holbrook Racing Engines is one company who has been developing many different parts and pieces for the Coyote 5.0L and the Dyno Joe project will continue that development. One product they are carrying into NMRA is Holbrook’s solution for block durability. “We’ve designed our own flange-style sleeve and use epoxy around it, I can’t speak for anyone else but that seems to be working really well for us so far,” Holbrook explained. Stock Eliminator prevents racers from porting the cylinder heads and running camshafts that are bigger than stock lift (unrestricted on duration and lobe separation), so the group will be exploring those tricks to pick up power over Holbrook’s Stock Eliminator engine packages.